Product prices and availability are accurate as of 2019-04-22 19:15:32 UTC and are subject to change. Any price and availability information displayed on http://www.amazon.com/ at the time of purchase will apply to the purchase of this product. Gas stoves present an obvious danger, but electric stoves get hot too. Wandering toddlers are curious and like to turn knobs. Use our Clearly Safe Stove Lock to prevent your stove knobs from turning. This patented design fits behind your stove's knobs and actually dials in and out as needed for you to operate you stove. If you think about it, you need to push your stove's knobs in to turn them. 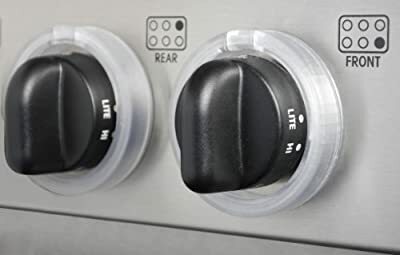 This new dial blocks the knob from pushing in without blocking you from the knob. No more spinning knob covers to worry with. This child proof dial has a safety lock that parents can press to turn the dial. The Clearly Safe Stove Lock works on most gas and electric stoves. Designed for professional and home use.